Do you love liver? If you are like almost 50% of Anglo-Western populations, the answer is likely no. In fact, surveys in some countries — UK, US, Canada — regularly find that liver is always among the top five most hated foods, often taking the #1 spot. To me, that’s a shame because various types of liver— beef liver, lamb liver, chicken liver in particular — are an inexpensive, tasty, nutritious food that is great on the low carb keto diet. Many people could be missing out on a powerful addition to their LCHF way of eating because of some preconceived notions or ancient aversions. But let’s deal with the widespread Anglo-American aversions first. Aversion on principle or from past experiences? Many people dislike liver on theory alone. If they are under 45, they may never have even tasted a dish like liver and onions. It’s the idea of touching, cooking and eating a quivery, jelly-like, bloody organ meat that filters toxins that is so repellent. It’s the idea of touching, cooking and eating a quivery, jelly-like, bloody organ meat that filters toxins that is so repellent. “It’s just disgusting,” said a young friend, who is on the keto diet. “I know I should eat liver, but I can’t get myself to cook it, let alone eat it,” she said, confessing that she had never knowingly tasted it — except pâté. It was the thought alone that disgusted her. For some, the hatred of liver dates back to childhood, especially among those over the age of 50 who were served it regularly prior to the 1970s. Liver was a staple in many family homes and frequently found on the menus of mom & pop diners. My mother served calf or chicken livers every few weeks when I was growing up in the 1960s and early 1970s. With its strong sometimes metallic flavor, grainy texture and the fact that many moms over-cooked it until it was rubbery and then served it with onions — another food many kids hate — liver became widely reviled. It was the sort of food that my friends recall slyly spitting into a napkin or slipping to the family dog. I loved liver as a child, which was a bit odd because I was otherwise a fussy eater. Squash, turnip, beets, cooked spinach, Brussels sprouts and mashed potatoes would make me gag, but liver I would lap up. My mom was always a great cook, and her liver was never rubbery or over-done. To me it was a form of comfort food — on a cold Canadian winter night, a dinner of liver, bacon and onions would satisfy me from head to toe. When my husband and I first met in the 1980s, one unusual bond we shared was our mutual love of liver as children — everyone we knew couldn’t stand the stuff. My mother stopped serving liver regularly in the mid 1970s, largely because it was high in cholesterol and fat and, in the start of the ill-conceived low fat era, health authorities were admonishing people to reduce dietary sources of cholesterol and fat for our health. She heeded that wrong-headed advice. Concerns were also raised, with the rise of factory farming and the feeding of antibiotics and hormones to livestock, that liver could concentrate those chemicals. That concern is not misplaced, and I make a point to this day of not eating liver from CAFOs – confined animal feeding operations. Despite my love of liver, I rarely if ever ate it for decades, up until this past year. 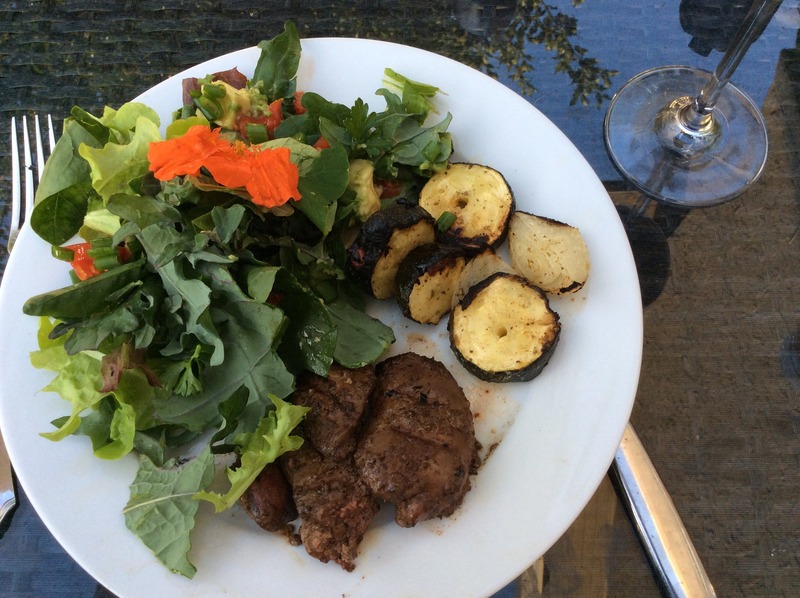 In the third year of my keto diet, I was looking for some more good sources of high quality, nutritious meat protein for a good price — so liver came back into my life again. While I never see it for sale in the large grocery stores —and would not buy it there anyway because of the connections to CAFO meat — our small local butcher, which specializes in products from local farms using humane, regenerative agriculture, always has loads of options, at very good prices. In its freezer case, a 275 gram (0.6 pounds) package of organic chicken livers is about $4 —enough to feed my husband and me, with leftovers for my lunch. The butcher is right on my walk home from my office so I pick up liver to make for dinner at least every two weeks. It a fabulous source of protein; 100 grams of chicken liver has 26 grams of protein; 100 grams of beef liver has 29 grams of protein. It contains all the B vitamins, and is particularly rich in B12, an essential vitamin for functioning of every cell in the body — that can only be obtained naturally through animal foods. Liver has levels ten times higher or more than other common sources. It is a terrific source of folate (Vitamin B9), which is also essential for key cellular processes – and especially essential for women in the reproductive years. It is the highest source of Vitamin A of any food — which is needed for healthy eyes, skin, teeth, bones, immune system, cellular functions. (Too much Vitamin A can be toxic, so it means you cannot eat liver every day, if you do happen to love it). It is a fabulous source of key minerals that are all essential to healthy body process, especially iron, selenium, chromium, phosphorus, and copper. With all these attributes, it is no wonder that liver and other organ meats have been so prized by cultures like the Inuit of Northern Canada and Sami of Northern Scandinavia. Animals seem to naturally know its benefits. Predatory animals, like lions, wolves and other carnivores usually open’s their prey’s abdomen to eat the organs — especially liver —first. If the consistency of liver makes it hard for you to prepare, work with it when it is still slightly frozen, or place it in a bath of ice and water so it is chilled. With a sharp knife, remove the connective tissue between the two lobes of chicken livers. Here is a good video demonstrating how to clean chicken livers. Some, like my mother, always marinate liver first in milk. I find a better marinade is a vinaigrette made of equal parts of olive oil, apple cider vinegar and Dijon mustard. An acid like lemon juice or vinegar softens or removes liver’s metallic taste that many dislike. While there are lots of complicated recipes that include raw eggs and oven water baths, it doesn’t need to be complicated for good results. 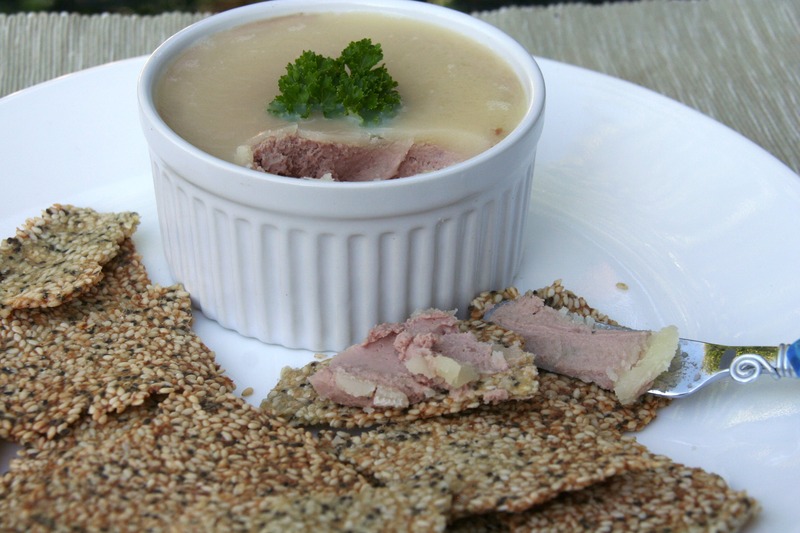 Diet Doctor has an excellent, easy pâté recipe. I make a simple paté by mincing half an onion and a clove of garlic, sautéing them in butter until soft in a frying pain. Then I add water to the pan, a bay leaf, herbs de Provence and the cleaned chicken livers, poaching them until they are still slightly pink in the center. I then transfer with a slotted spoon the liver and minced onions to a food processor, add some melted butter, a dash of cognac or brandy and a splash of whipping cream (enough so that when processed it is creamy and smooth.) I spoon it out into ramekins and top with melted butter. It lasts for a week in the fridge and freezes well for a couple of months. In summer, we love grilled chicken livers on the barbecue. We marinate the clean chicken livers in the vinaigrette for 8 to 24 hours, put them on skewers and grill. I often grill cherry tomatoes and onions, too, then serve with a simple salad. Delicious. Another delicious way to grill is to simply wrap chicken livers in bacon, put on a skewer and grill. If you want the nutrition but want to hide the taste or texture, chop liver into tiny pieces and add to ground beef for hamburgers, Bolognese sauce, stews, or tacos. Liver and onions is a classic dish. I start by frying four of five slices of bacon, setting them aside when done and removing some of the fat. Then I sautée slices from a whole onion until tender, then add in the cleaned liver, cooking until just a bit pink. At the end, I pour in about ¼ cup of whipping cream to de-glaze the pan and make a nice rich, flavourful gravy. I served with the bacon, a green vegetable or salad, and sautéed herbed tomatoes (done in a separate skillet), which makes make a perfect replacement for ketchup that many of us used to slather on liver. Are you willing to try adding liver to your keto diet? What are your favorite recipes? If you got over an aversion, how did you do it? Share your tips and tricks below. When growing up, I ate beef liver and hated it. We always overcooked it. Now, I slice beef liver into relatively thin slices, fry it quickly over high heat (cast iron pan, hottest heat our gas stove will produce, ghee), and flip. I leave it close to raw in the interior. I find this to be great. For chicken livers, I'm still getting used to those. My mother was a great cook, and we had liver, usually beef liver, at least once a month - with onions of course. I loved it growing up; haven’t had it in a while - going to change that here real soon. But you are right, when we were warned to watch cholesterol, etc., we cut back on eating it. Seems those darned know it alls didn’t know it all after all ! Chicken livers wrapped in bacon a perfect snack from the fridge or great for lunch with salad. I've recently discovered tinned cod livers. They are delicious. I had cod livers and boiled eggs for breakfast this morning. Was wondering how they rate on dietdoctor? I enjoyed the article,thank you. My mom used to fry it (Beef liver) then let it cool a bit and serve as a salad with onions and bell peppers. I looooved it! I have never done it myself - and am 51 right now! - what a shame... but with this little "incentive" I will try it! Again, great article! Please dietdoctor help us with more recipes for "tail to nose" use of the animals! I love chicken liver. Either wrapped in bacon or fried in fat, they are wonderful. Liver is the meat I would never make with butter but with lard or duck fat. Even better if you melt really very fat bacon and fry the liver in it. Only salt and pepper is needed to make it a wonderful dish, but when I got a bit bored, I add marjoram or parsley or thyme (only one at a time). My mom made liver pate, I do not know how special it was, but I really liked it. Fry the chicken liver in very fat bacon (and lard if the bacon is not fat enough), add salt, pepper (originally liver was fried with onion but recently I just leave it out). Grind it with boiled eggs into pate, add some mustard afterwards. I quite often take a recipe for tuna in olive oil and exchange tuna for liver pate and it just works fine. My mother used to make the best fried chicken in the world and would always fry the liver. I loved it! She did, too. My later, pre-teen aversion to liver was completely psychological. The thought of eating liver grossed me out, so I never ate it again until my adult years when I occasionally eat pate. My husband loves beef liver & onions, so maybe I’ll introduce liver back into our lives sometime soon. The thought of eating it still doesn’t appeal to me, but the nutrients we’ll be getting do. I too used to regularly eat lambs liver and onions as a child growing up in Ireland. We also had fried kidneys at least once a week. I don't know why but we stopped eating them in the 80s, maybe we were also mislead about the high cholesterol. I am just back from three weeks in rural France and livers and kidneys were on several menus where we ate and were absolutely delicious. It was a delight to rediscover this food especially when eating Keto. Loved this post, although fasting today so have to stop drooling! When I was at school in the UK in the 1970's, we regularly had liver. It was always cooked to perfection, never chewy, from the tenderest cuts without vessels and was always cut into inch-sized cubes. Probably because of this I have always loved liver, and make chicken liver pate regularly. When I started the ketogenic diet I was delighted that eating liver was encouraged, but searching the internet for exciting and innovative recipes turned up very little. I had them with mushrooms and marsala wine, but would love to hear of some other recipes from the communities. I generally love liver. I know there's some reason I'm not supposed to eat it a lot (Vitamin A you say? Ok, maybe.) But I often wonder if-since the liver is deeply involved with removing bad stuff from bloodstreams, is the bad stuff accumulating in that organ? If I get liver from Beef that used antibiotics or pesticides, am I getting that stuff? I have a friend who raises meat birds (chickens). Because I know they don't like liver, I get them free! I can get a whole year's supply in one go. I love them cooked simply with salt, pepper, onion and butter. They are great with cooked veg, or salads. And my husband will eat chicken livers now too. So glad that they are allowed in keto. Love chicken livers :) I first fry bacon and onions then add the chicken livers with a bit of either chicken broth, water or brandy. Slow cook them. They will go tough if you use high heat. What is the weight (ounces) per single serving of chicken livers? My recepie; Slice the live in fairly thin slices. after having rinced the liver in water and dried off . Finely slice onions...as many as you like but it should be a lot! and then let that sweat in a frying pan with butter. Remove the onion from the pan and let is rest on a plate or bowl. Put some flour of the type you want....on a flat plate , together with salt and white peppar. Coat the liver with the mix and shake some of the mixture so it isn't too thick. Fry in lots of butter for about 3 minutes per side. Add the onions for the last minutes and let them warm up again. Serve with grated carrots mixed with small pices of orange, lingonberries (no need to make jam, "vattlingon" will do). If you like, you can serve it with fried bacon-rashes. Thanks for the article. I am a regular consumer of chicken liver. Please note that the author is stating the price of raw chicken liver and the protein content of cooked liver. 100 grams of raw liver has 17 grams of protein. Also beware of the carbohydrate content of liver. Chicken not so bad at at 0.73 per 100 grams raw. Beef, on the other hand, 3.89 carbs per 100 grams raw. (The beef does have a little more protein.) The carb issue has caused me to stay with chicken livers. However when I get a slaughter animal I will grind the liver into a sausage blend mitigating the amount of carbs consumed. Last year my neighbor killed a deer and I butchered it -- we shared out the meat. Two pound liver into the sausage :-)). I'll be trying out the pate recipe. I just made grass fed beef liver this past week. I hadn’t made it in years since my husband doesn’t like it. I grew up with it and always liked it. I made it with bacon and onions. It was so tender. I had enough for 3 meals. I made it this week because my husband was out of town. Definitely will make again. I actually know friends who eat liver straight from the goat and don't even cook it like in "Saudi Arabia". Love liver. I have venison liver and rabbit liver in my freezer right now and this post reminded me it's time to get it out and enjoy it! !! I sneaked my monthly calf's liver to dog ..until my brother grew older and tattled. Decently cooked [dry],w/bacon and onions and ketchup if desired. BUT, Mom also made a liver Pate', I loved. Wish I knew the recipe but she was freeform in her cooking. It was liver and vegetables,done in Waring blender. EXCELLENT. She also would order CALVES LITTER WHEN WE WENT OUT FOR DINNER, "I really SHOULD ...order this. Mom was Horticulturist and proponent of Adelle ! I still reap the benefits of her natural foods ... this started in early 1950's. ps/she tried Tripe, tossed it ! long winded and hope I said something,thank you for your article ~! Just had calves liver for supper ... seasoned liberally with Himalayan salt, and black pepper. Sautéed in bacon fat until crisp on either side but pink in the middle. Served over an enormous kale salad with Parmesan shavings, crispy bacon pieces and an olive oil and balsamic vinegar dressing. Leftovers for lunch tomorrow.